The courses run from our workshop in Coverack, on the Lizard Peninsula, Cornwall. Richard has had 14 years experience teaching furniture design and making and is a qualified further education teacher. All courses include health and safety in the workshop. Materials, equipment, tools, lunch and refreshments are provided. If you are needing accommodation, we can organise this for you locally at cost. If you would like to talk to Richard about a course to suit your needs (or different dates to those above), don't hesitate to ask. Richard covers all levels whether you are a hobbyist or a professional needing to refine a certain skill. The following course is suitable for beginners and those wanting to refine their skills. This course is aimed at beginners and those wanting to refine their skills. Concentrating on the use of tools, sharpening techniques and joint cutting. This is an intermediate course but is also suitable for beginners. Richard will discuss with you prior to the course what level you are and adapt the course accordingly. At the end of this course you will have learned to accurately mark out, used chiselling, sawing, jointing boards, gluing and clamping techniques. As well as planing to a high finish, in the production of your occasional table. The following courses are suitable for those who have completed the 2 day Introduction course or for those who have the equivalent experience. Learn how to restore and tune up your old plane. Learn how to sharpen your chisels, planes and spoke shaves. How to maintain and store your tools. The following courses are suitable for those who have completed the basic course as well as the dovetail course unless you have previous experience. On this course you will learn tool and cutting skills, how to make the perfect dovetail, routing, veneering, lock fitting, and finishing. By the end of the 5th day you will have a finished trinket box. 2 days a week for 6 weeks. On this course you will make a simple chair from template using hand skills. You will learn tool and cutting skills, joint cutting, shaping, spoke shaving, shaping, scraping, planing, chiselling, finishing and basic upholstery of a drop in seat. By the end of the course you will have made an upholstered seated chair. On this course you will learn how to cut lap and through dovetails, to make draw slips and plane finishing. Just completed a two day furniture skills course in Richard Buckingham’s workshop and teaching studio. Learned lots of new skills and improved my ability to sharpen planes and chisels, use a plane, mark out properly, cut to the line and make a variety of joints in lovely wood. All under the guidance of a professional cabinet maker. Richard is a very patient and skilful teacher, who took time to make sure I was doing things the right way. Because the groups are always very small he can give a lot of personal attention to each person. Lunch was nourishing home-made soup, bread and cheeses. The setting is very close to the pretty Cornish harbour and coast of Coverack. He arranged for me to stay there in a comfortable and friendly B&B, Fernleigh, run by Ann Rogers, who cooked me a delicious evening meal and breakfast. For me it was a very enjoyable experience. Thank you, Richard. I'd booked onto a woodworking course through Cornwall College last year, but it was fortunately cancelled. I say fortunately because it meant that my family paid for a two day course with Richard at his training facility near the Lizard as a Christmas present. 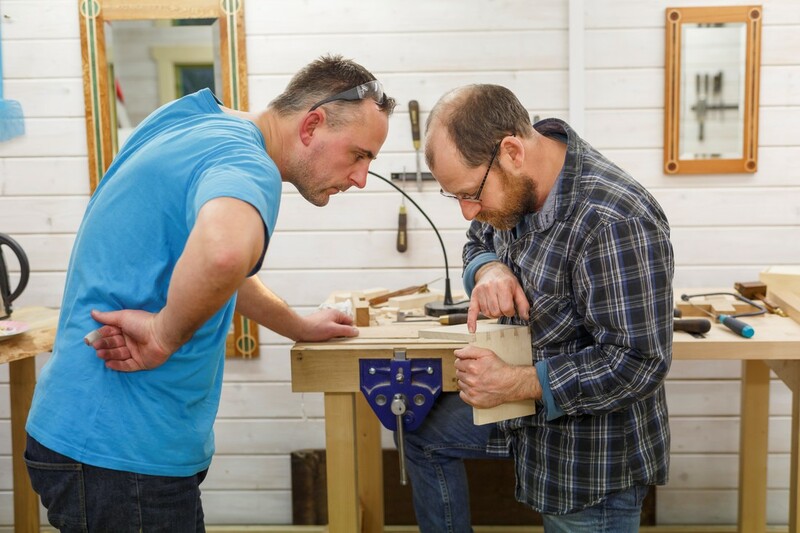 From the moment I arrived I was made to feel at ease, and it was more like spending a weekend with a mate, whilst learning great techniques that I know will transform my woodworking. Fantastic teachers are few and far between, but we all remember the best ones from school. Richard is one of those teachers! If you're keen to learn new skills, whilst having fun in the process, do not hesitate to book yourself on one of his courses..... I will be booking another one very soon! Cheers Richard! A very informative course that gave more than enough room for questions, technique and good workshop practice to be explored. Delivered in a welcoming environment, it was a pleasure. Thanks. From the moment I saw him do the most mesmerising dove tail joint in minutes at an art exhibition, I knew he was the little genius I needed to learn from. I was not disappointed Two day course was excellent, I want to learn more now. "Richard Buckingham is a first class furniture maker whose enthusiasm for perfection has spilled over into his varied courses. His approach to instruction is friendly yet detailed and is tailored specifically to the student's individual requirements, both enthusing and inspiring. I have attended two courses so far and am already booked to visit again soon. The relaxed yet informative atmosphere is complemented by the local surroundings and the hospitality of the host. After 23 years in the Royal Marines I have attended many different courses. These are by far the most enjoyable and beneficial to my future career outside of the MOD. Many thanks to Richard and I will be back for more" - One very happy customer and service leaver. I just thought that I would write to you and thank you for your advice and instruction (also the lovely lunches) during the last two days. For me it ticked all the boxes. It put me back on track, ensuring that the fundamental tools within my tool kit are operating at their full potential. My old planes have never been so efficient in operation and it is so pleasing to see a wafer thin shaving coming away with little effort. The course covered other aspects regarding techniques of using chisels and scrapers which will prove most useful when other projects are being attempted. I am looking forward to attending another course in the not too distant future. Just spent 2 days with a craftsman. Richard is a brilliant tutor who is patient and adaptable to our requests. The workshops are not for the faint hearted as each day starts at 9am until around 5pm. There is no rush and nothing is too much trouble. 100% recommended! Many thanks for the best ever workshop I have been on. Would definitely recommend Richards courses to anyone looking to get into all aspects of woodwork. Lessons were amazing as was the lunch that’s provided. If you're considering getting into woodworking then I can't recommend Richards introduction to furniture making course highly enough. Having not done any sort of woodwork since leaving school nearly 20 years ago, I went in as a complete beginner. 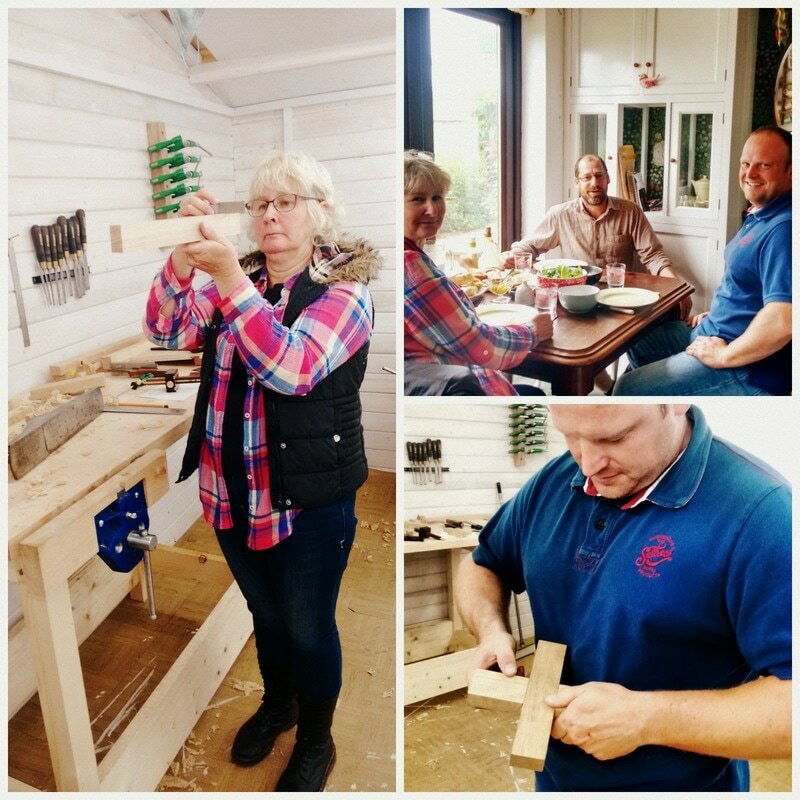 Richard's teaching style puts you (and the other people on the course) completely at ease and makes you feel like you're spending the weekend with a group of old friends rather than in a 'classroom' and he conveys information in such a way that before you know it you're sharpening tools, planing oak to a mirror finish and cutting joints with confidence. Lunch in the workshop was fresh, wholesome and homemade, and Richard makes a proper cup of tea and coffee (although I think our class blew the coffee budget for the year!). All in all, if you have even an inkling that you might fancy working with wood, get on this course. I shall definitely be saving up for the dovetail course next. Ally Jensen recommends Richard Buckingham Furniture & Courses. Richard Buckingham’s Introductory 2 day course that attended in September was just what was needed to get me started again on some serious woodwork. Richard was an excellent teacher and managed to make an understanding of the subtlety of planes and planing interesting and accessible. There was great satisfaction in producing a couple of simple joints to high accuracy and fine finish straight from the plane, saw and chisel. The company and the lunch was good too. I’ll be back.